With this review, the TRENDnet TEW-828DRU AC3200 Tri Band Wireless router joins the four other AC3200 class routers in our charts, i.e. NETGEAR's Nighthawk X6 Tri-Band WiFi Router (R8000), the D-Link's AC3200 Ultra Wi-Fi Route (DIR890L/R), Linksys' AC3200 Tri Band Smart Wi-Fi Router (EA9200) and ASUS' Tri-Band Wireless Gigabit Router (RT-AC3200). All five products are based on Broadcom's XStream technology which features two 5 GHz 3X3 radios and the ability to steer "slow" and "fast" clients to different radios to maximize total wireless bandwidth utilization. The physical design of the TEW-828DRU is a significant departure from TRENDnet's other routers, with its move from internal to external antennas. 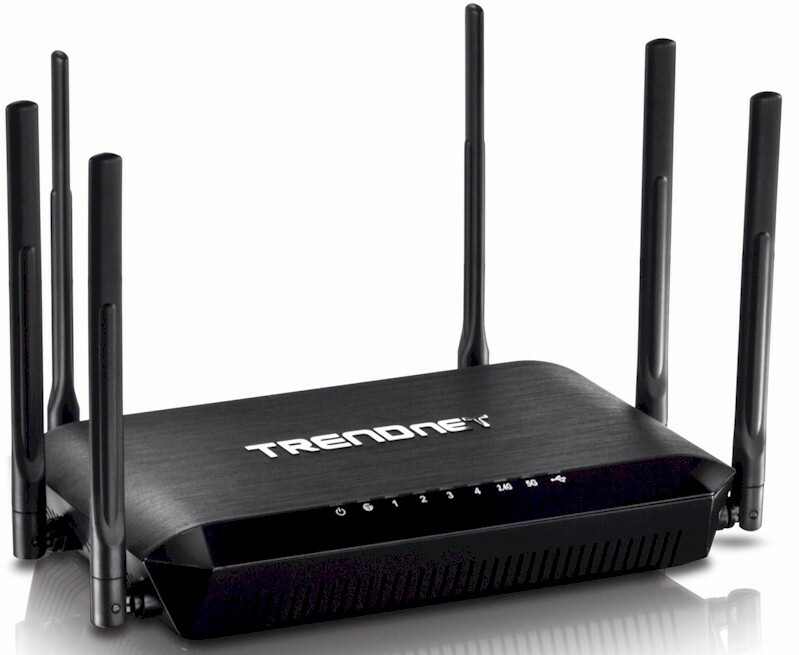 But unlike other AC3200 routers, the TEW-828DRU's antennas are hardwired to the router. There are two antennas on each side of the router and two antennas on the rear. The chart below shows the front panel indicators. Note that there are separate LEDs for each of the 5 GHz networks. The rear panel has a color-coded Gigabit Ethernet WAN port along with four Gigabit Ethernet LAN ports. The TEW-828DRU is powered by the same Broadcom BCM4709A router SoC with three Broadcom BCM43602 dual-band radios found in all of the AC3200 class routers reviewed to date. TRENDnet chose Skyworks' SE2623L for the 2.4 GHz power amps (x3) and Anadigics' AWL5911 (x3) for the 5 GHz power amps (x3). Facing front of router, the 5 GHz-2 hi-band radio is on right. The shared 2.4/5GHz-1 low band radio is on the left. The lone heatsink sits atop the BCM4709A SoC. Table 1 below summarizes the key components of the TEW-828DRU as well as the components of our currently top-ranked ASUS RT-AC3200. The two are basically the same except for some of the power amplifiers. 128 MB 128 MB ?